Cloncom.com is one of the 10 biggest calling card companies according to our most recent website traffic rankings data. Cloncom.com is a reseller that markets prepaid phonecards for several 3rd party telecom carriers, including IDT, NobelTel, Primus, and Vectone. As with most calling card resellers, these carriers are lesser known 2nd and 3rd tier providers and/or international VoIP carriers. Such carriers generally provide perfectly good voice calling service while charging much less than Tier 1 carriers such as AT&T or BT. In additional to calling cards, Cloncom offers virtual local phone numbers for selected countries, PC-to-phone calling (a type of VoIP service), and mobile prepaid plans for selected mobile carriers. In light of changes at the company, we are in process of updating our Cloncom.com review. In the meantime, we recommend that you consider other companies, such as Pingo.com or Comfi.com. 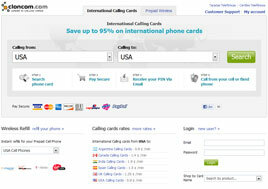 Description Cloncom.com is a reseller of prepaid calling cards, and other products, on behalf of several 3rd party telephone companies. They are one of the 10 biggest calling card companies according to Alexa.com. Parent Company Clon Communications, Inc. Competitive prices During our most recent price check (06 Aug 09), we found that Cloncom rates have not fallen as much as other vendors. Whereas previously they had consistently low rates, now it is more spotty - some rates remain very low, but others have not kept pace with the market. Wide selection of cards Not the biggest selection, but plenty to choose from. Website usability Good website, nice display of search results, shows prices in multiple languages. Live customer support Cloncom no longer seems to offer live phone support - only 24hr email support. Carriers are disclosed and appear reputable and accessible Carriers are not specifically identified for each card, but Cloncom customer service will tell you and they directly assist with any carrier-related issues. Their carriers appear solid. Good reputation / complaint history Generally positive reviews, but, as with any calling card company, a few complaints here and there. Fair return, exchange, and balance transfer policies Allows transfer of unused balances, refunds on 100% unused cards only. Overall, we give Cloncom.com a 'recommended' rating, but are disappointed to see that their rates have not kept pace with the market and are now higher for some cards than you can find elsewhere.